One of my biggest pet peeves in gaming is when a game scatters dozens, sometimes hundreds, of collectibles throughout the environment in an effort to boost replay value. The Grand Theft Auto series, in particular, is notorious for this, but this is a common practice in open world games. I usually don’t bother to go back through and find these random trinkets, but I made an exception for this year’s Tomb Raider reboot. You see, in Tomb Raider, it’s actually *fun* to explore the world it presents. A novel concept, right? 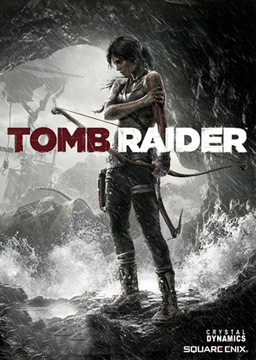 In this reboot, a young Lara Croft and a team of archaelogists/adventurers have embarked on an expedition to find the lost kingdom of Yamatai, an island off the coast of Japan. Little is known about the island, other than that it causes death and destruction for those who near it. Sure enough, upon arriving to the area, the crew’s ship crashes in the midst of a violent storm, and the group becomes stranded on the island. As one might guess, it turns out that they aren’t alone on Yamatai. A violent cult of “Sun Queen” worshippers inhabits the island, and they don’t take kindly to visitors. As Lara navigates through the island in an attempt to find a way off of it, the cult members are there nearly every step of the way. They are a huge problem at first — especially since young Lara has never encountered such violence at this point of her life — but by the end, they become nothing more than mere nuisances. The evolution of Lara Croft from an ambitious archaeology graduate to cold-blooded adventurer is marvelous, and quite frankly, it’s one of the biggest reasons to play this game. Not only is her transition to a hardened explorer believable, she also looks anatomically correct for once. Crystal Dynamics did an excellent job developing Miss Croft, humanizing her while showing the immense suffering she receives along the way. The other major player in the game is the island of Yamatai itself. This is a gorgeous island full of wild life (including boars, wolves and rabbits, all of which can be hunted), and there is so much of it ready to be explored. The island is incredibly well-designed, as anyone with a sense of adventure will surely be curious enough to climb the various ledges in hopes of seeing where they lead. While the story is a fairly straight-forward affair, there are plenty of opportunities to traverse the wide-open world in order to find relics, documents and other historical items scattered about. Hell, I found myself visiting every nook and cranny of the island just for the beautiful views they might provide. Seriously, this is one gorgeous-looking game, easily one of the best from this console generation. 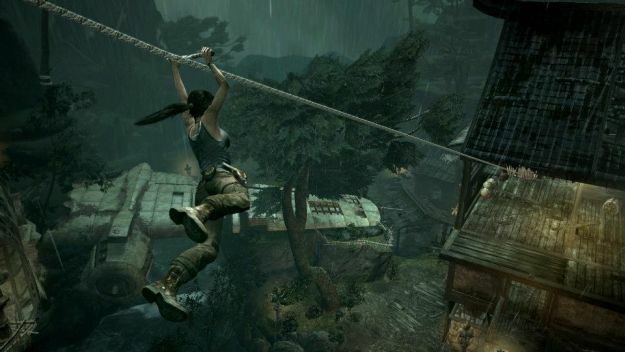 As this is a tale of survival, much of the gameplay revolves around Lara doing what she needs to do to survive and get off the island. A convenient XP system allows her to “level up” by killing enemies, hunting animals and finding treasure. These experience points are in turn used to improve her current capabilities, such as adding a rope gadget to her bow, or adding extra ammunition for her guns. What’s great about this feature is that every improvement is shown on screen. If you add the rope gadget, for example, it will appear on top of the bow and remain visible while harnessed on Lara’s backside. This attention to detail is very impressive, and it only adds to the sense of realism within her character. Also on the island are a handful of optional tombs that can be explored, and each one presents an interesting little puzzle. Some of them are real head-scratchers, but the reward at the end is always worth the trouble. Each tomb has its own chest full of goodies to help Lara, often including treasure maps that show locations of collectibles in the area. 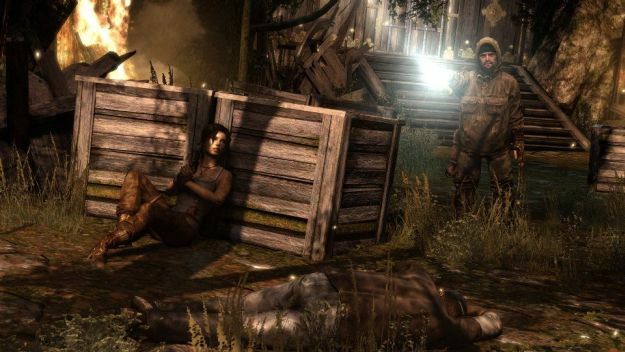 Miss Croft also has the unique ability to use her “survival instinct” — with the quick press of a button, the environment turns gray, and any items of interest are highlighted in yellow. This is similar to Batman’s detective mode in the Arkham games or the Eagle Eye vision in Assassin’s Creed, and it comes in handy quite often. At times, it perhaps makes things too easy, but it can be avoided altogether for those who want a bigger challenge. The single player campaign lasts anywhere from 10-15 hours, and it plays out much like an Indiana Jones movie. There are several big adventure scenes that will leave you breathless, but at the same time, there’s nothing “new” here in terms of storytelling or action setpieces. If you have played any of the Uncharted games, you will know what to expect, though that’s not necessarily a bad thing. Tomb Raider also features a multiplayer mode, but it is merely tacked-on and mostly irrelevant. The online features were dead on arrival, as the community has dwindled rapidly, making it difficult to find matches less than a month after its release. I played online for a couple hours, enough to get a feel for the three different modes, but it did not leave a lasting impression. This has always been a series to play for the single player campaign, and this reboot is no different. While it’s still quite early, Tomb Raider stands as one of this year’s biggest gaming highlights so far. As far as adventure games go, this is one of the better ones, and it also happens to be a technical marvel. This series received a much-needed breath of fresh air with this reboot, and I’m curious to see where Lara Croft goes next. Nice review Eric. I absolutely loved this, thought it was fantastic. Probably my only gripe was that it felt a little too linear and scripted at times, I liked the areas where I could explore a little more, but that’s a minor issue. Also, I wonder how much of the game Lara spends falling, all she does is fall! Haha yeah, she did fall quite a bit, didn’t she? I get what you’re saying about the linear areas, but I thought it was a nice mix of that and open world gameplay. Glad to hear you enjoyed this one so much, too! Keep hearing so many good things about this, will definitely pick it up some time soon! Haha yep, she is definitely more realistic this time around. It was pretty cool to play her “origin” story, and the non-stop action was reminiscent of an Indiana Jones movie. I still haven’t picked this up yet, but it is definitely high on my list of games that I will get soon. I actually was tempted to buy it today off of the PS Store since they have it half off. Decided against it though since I’d prefer to have the physical copy. Thanks man. That’s a pretty good sale this weekend, but I can definitely understand wanting to have a physical copy. It seems to be going on sale a lot lately, so maybe you can snag it for cheap on Amazon or something. I played this on PS3! I really enjoyed it. However, it didn’t feel like a Tomb Raider game to me. Also, there were a lot of shots focusing on her.. cleavage haha. You know, I never really played much of the Tomb Raider series before this, so I can’t compare it. But glad to hear you enjoyed it so much, even though it changed. I’ve started playing this game a couple of weeks back and I’m looking forward on continuing, but I started Ridge Racer Unbounded around the same time and sunk all my gaming time into that. What I’ve played from Tomb Raider I really like. The atmosphere is great and it looks beautiful. Oh cool, I didn’t even know there was a new Ridge Racer game available. I haven’t played one of those since the PS1 days. Might have to check that out! Tomb Raider is consistently great from beginning to end. I think you’ll really enjoy the experience. Good looking review. It’s nice to see some well written content in the video game department of the blog world. Too many people just want to chug out a rough draft and throw it on their blog! Thanks for the kind words — I truly appreciate them.